I am sitting here at my dining room table in Tahiti French Polynesia, I can see the jar of Vegemite sliding across the kitchen bench, the whole place is violently rocking form side to side. I reach over and pick up the Vegemite, as I look out the window I can see a big fishing trawler drive by. Just beyond the trawler a beautiful left hand wave reels down the inside of the pass, I finish the last of my morning coffee, select my favorite board from my quiver in the corner and jump into the dinghy to motor out to the pass. I often wonder how I ended up where I am. 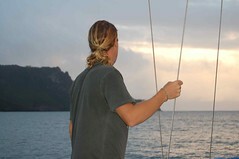 At the age of 25 I find myself living alone on my 34 foot sail boat â€œBali Haiâ€ cruising around the South Pacific Ocean. It has been some hard work to get here, I have had some testing times but also have reaped some breathtaking rewards. 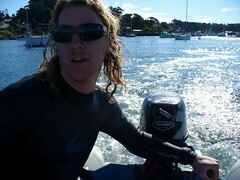 I left Australia on June 13 2006, I flew to California on a one way flight to buy my dream boat. 2 days later on my 24th birthday I was the new owner of Bali Hai, the work begun soon after. 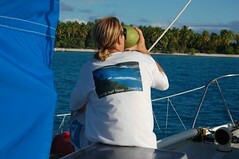 For nine months I lived onboard and worked two jobs while at the same time transforming my boat into an ocean cruiser. 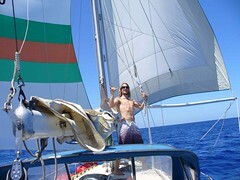 In April of 2007 I set sail for Australia. Glued to the radar screen in the dead of night with graphics that resembled a cheap 80's video game I weaved my way through the dense shipping traffic of L.A. and headed south towards the boarder into Mexico. After wandering the isles of the marine super stores in San Diego for the last time I departed for Mexico at midnight on the 2nd of April, the early hours of the 3rd saw me taking a shot of tequila as that imaginary line in the water went by, I was free of America... Two days later however saw me back in Californian waters with armed customs officers searching my boat. I had got into Mexico only to find that my long range radio wasn't transmitting, without weather information or emails I had returned to America to get parts for repairs. Apparently it looks suspicious having only gone to Mexico for a day. When the customs officers kept asking if I had any drugs onboard I couldn't help wondering if the large Bob Marley poster on the wall had some influence? As I made my way down the Mexican coastline I had high hopes of long sandy point breaks, the whole time I was in California I had friends penciling surf spots into my charts. 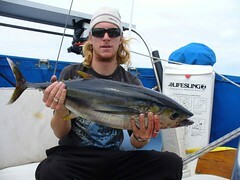 Huey had other plans for me, the whole time I was in Mexico the biggest surf I found was 1 foot. One particular point break had huge potential, I could see the wave would be absolutely amazing with a little more swell. The reports were saying that there was a swell on the move towards me, so I sat and waited, and waited..... nothing.... With my best efforts I could only get a short ride before stopping and sinking into the wave. I needed more power..... It wasn't long until I had my zodiac in the line up, with the assistance of the outboard I was able to get that little boat doing re-entries and cutbacks as the wave ran down the point. There is always a buzz available from the ocean. 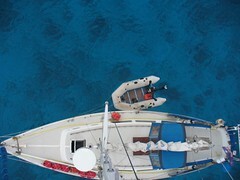 From half way down the coast of Baja I pointed my boat out at the horizon and took off for French Polynesia, ahead of me lay nothing but blue ocean for 2600 miles. If you can imagine how long a 5 hour car ride can take, then think about a 26 day ocean passage with now fuel stops. Days began to blur together as the miles slowly made their way past me. 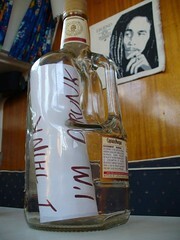 I managed to amuse my self by sending out a few messages in bottles, which I hope to provide future entertainment by not washing up in the back yard of the chief of a small Vanuatu village who speaks no English and can't send mail. When I came into stones throw of my land fall of Polynesia in the Marquesas Islands I attempted to use the last few drops of fuel to motor into the port. The motor however didn't want to wake up from its sleep. I was forced to point the boat back out to the safety of the sea while I went below and found the faulty pressure switch that was denying me my smooth entry. Finally the last of the beer came out soon after the anchor was set safely in the bay. The feeling of accomplishment was amazing, the sights and sounds of civilisation were overwhelming. Just days after arriving in Polynesia I ended up with serious engine troubles, the saltwater cooling system had eaten a hole right where you don't particularly want a hole in an engine. This prevented me from leaving for my next destination for 2 months as I waited for the postal system to deliver a key part from America.After numerous phone calls explaining that 'no I can't pick the package up in Tahiti I actually need it in the Marquesas' the parcel finally arrived. After putting it all together I was only to find that another part was also damaged and needed replacing. I had learnt my lesson with the postal system and took advantage of a fellow cruiser who was flying to California for a wedding. 3 weeks later I was finally mobile once again. 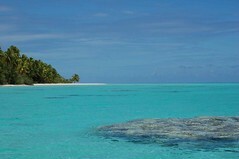 Tuamotu archipelago. I had high hopes of world class waves with small crowds. With the swell dropping out as I made the 5 day passage I had decided to do a scenic trip on the way to the surf, with adrenalin pumping through my veins I piloted Bali Hai successfully through the first of the dangerous reef passes. I dropped the anchor among the coral and went to shore to replenish the fresh foods onboard, while I did know in the back of my mind this couldn't be done I was still dreaming..... The Tuamotu are incapable of growing vegetables in the soil, the best I could do was potato, carrot and onion brought in on the supply boat, so began my passion for coconuts. The quest for food did lead to me meeting an amazing family that took me in as one of them for my brief stay, the fact that I was sailing alone and at my age was a small shock to them. As a result of this I now have a friend to visit during the Teahupoo competition at Tahiti in April, Riche often takes the pro surfers into his second house at Teahupoo during the comp. When I finally hit the surf on a neighboring atoll I was some what apprehensive at first, I was surfing alone on a small left hander running down the inside of the pass. The wave was relatively gentle and playful but the reef had a certain menace about it, the coral heads that made up the reef would swirl up into the wave as it passed. I was forced to surf in such a way as to time my bottom turns around the coral to maintain a full set of three fins, each time I fell I would be applying all my energy and thoughts to falling flat and not allowing the wave to push me onto the coal lurking below. 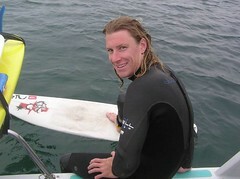 Over the next 2 days as a swell rolled in, I learnt the trick to the wave, just don't surf small waves there. With the larger swell the locals began to join me in the water, the wave moved off the reef into deeper water and the magic began. 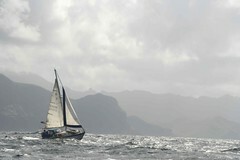 I was relaxing and at one with the wave as I left the world behind and indulged in the rewards of my previous efforts. On the morning of the second day I was out surfing in perfect 4-5 foot waves before a squall moved in, the wind shifted direction and picked up. With the change I saw the less than optimum conditions as a chance to go and get some rest and food on the boat, I paddled back Bali Hai sitting just behind the break and climbed aboard. As I reached for the towel hanging in the companion way I was taken back by the sight of 6 inches of water covering the floor of my home. I jumped inside and threw on the pump before pulling the engine cover to find a broken pipe fitting, 15 minutes later I had all the water out of the boat. If that wind change hadn't have come through, I don't know if I would have noticed my boat slowly creating an artificial reef. I spent the rest of the day watching the surf out the window as I cleaned up and repaired the fitting and the faulty pumps that should have automatically taken the water out. 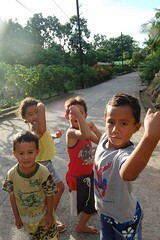 - Spending a week on a small tropical Island with the Polynesian family. - Clothes No shoes but thongs are great. 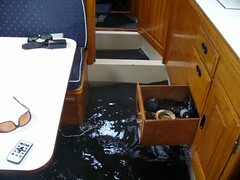 - Important Sailing Stuff (like Rum) & upgrades for boat, anchor chain and rhode... new bilge pump.